Steve Smith is not only known as one of this country’s top mandolin players but also as an outstanding educator. Along with his work with the Roots/Bluegrass group The Hard Road TrioSteve has been on faculty at the California Coast Music Camp, Puget Sound Guitar Workshop, Steve Kaufman’s Acoustic Music Camp, Colorado Roots Music Camp, Hill Country Acoustic Music Camp, Zoukfest and Camp Bluegrass (for sixteen years running). Smith has appeared at festivals and venues including Hardly Strictly Bluegrass, High Mountain Hay Fever, Rocky Grass, Swallow Hill, Freight and Salvage, Oklahoma International Bluegrass Festival, the Big Horn Mountain Festival, and the Minnesota Old-time and Bluegrass Festival. With the Las Cruces Symphony he has performed works of William Grant Still, Gershwin and George Crumb and the musical Chicago. 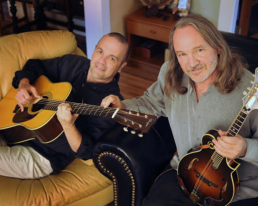 Along with thirty years of coast to coast touring, Smith has performed in Ireland, Germany, France, Denmark, Sweden, Switzerland, the Netherlands, Cuba and the US Virgin Islands. He has also performed in musical theater in Cotton Patch Gospel (multi-instrumentalist, vocalist and actor) and the Robber Bride Groom; he composed and performed the score for a production of the Sam Sheppard play Curse of the Starving Class. Steve has appeared on over 30 albums as performer and producer including guitar legends Jim Hurst, Mitch Perry, and Tim May, banjoist Bill Evans, Alan Munde and Tim O’Brien. His music has been heard on countless radio stations across the US and on the Discovery Channel, The History Channel and even the Weather Channel. Flatpicker Tim May has been working in the Nashville area for over 20 years as a sideman, session player, band member and performer. Higher profile projects have included touring with Patty Loveless and John Cowan, and working as a regular on the Grand Ole Opry with Mike Snider. Tim was the solo guitarist on Charlie Daniels’ recording of I’ll Fly Away, which was nominated for the Best Country Instrumental Performance Grammy in 2005. That same year he was session leader on the critically acclaimed Moody Bluegrass album (he later played on Moody Bluegrass II as well). The Nashville Scene selected Tim in the Best Instrumentalist category in their 2012 Reader’s Choice Poll. PK Thompson Guitars, Shubb Capos, Elixir Strings, Benedetto Guitars, L.R. Baggs Pickups and Pre-amps and Breedlove Guitars all have presented professional endorsements to Tim, a serious nod to his talents.